Libretto in Italian by Franceso Maria Piave. Based on "Lady of the Camelias" from Alexandre Dumas son. 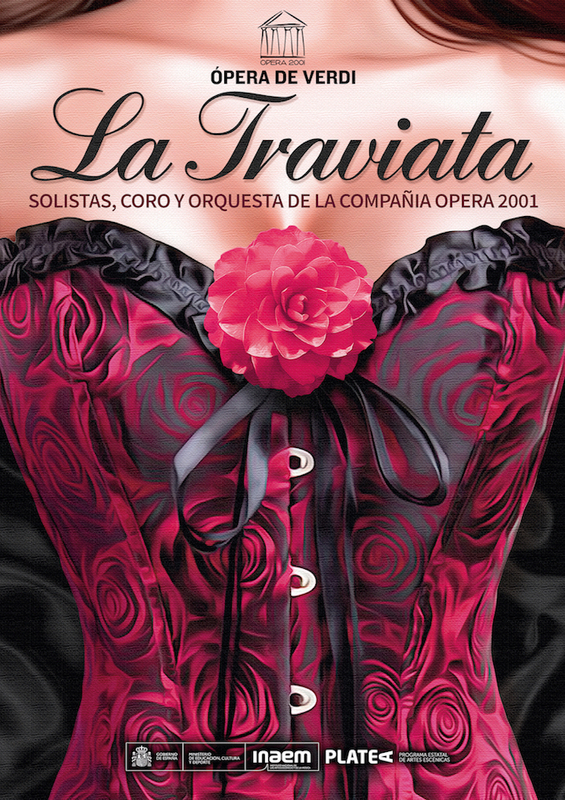 Original title: "La Dame aux camélias"
La Traviata is one of the few examples of lyrical works directly taken from a contemporary work, and from that point of view, it is not surprising that this opera prefigures the dramas of the realist school. Regardless of the subject, the score is among those showing the best VERDI: the dramatic efficacy of the music accompanied by new surprising harmonic plane, melodic or rhythmic, displaying a completely new science by the composer, the prelude is an example remarkable about it: suddenly, VERDI "describes" what is the essence of drama and anticipates its conclusion, as a counterpoint to a brilliant orchestration that evokes the frivolous and idle life of the heroine, are the two major themes of the work, the love and, above all, death. It is worth noting in particular that VERDI proceeds musically the other way around: to start he offers the sound image of the death of Violet (which will resume in the prelude to the last act); next he presents the orchestral echo of the the sufferings of heroin, and later on hes love for Alfredo, to end with the nonchalance Parisian party over which the curtain rises. On the other hand, the success of the opera lies in the constant beauty of the vocal writing, especially for the role of Violet, first virtuoso, after a passionate lyricism, sometimes morbid, almost suicidal, the last act is especially characteristic of this new "way" of VERDI, in which psychological analysis anticipates the external vicissitudes, making the singing invested in the depth of feelings. It calls for a deeper reading of the score in full-unfairly discredited by the aesthetes and often by professionals-conventions are certainly not lacking in it (choral interventions, the cavatina and cabaletta of "noble father" in the second act), but melodic findings abound, we can not be insensible to the extraordinary plasticity of the recitative, extremely elaborate, not "narrative", but rich in emotions, where every note seems full of intentions. In Violeta’s living room, the « Lady of the Camellias » and also the most coveted courtesan in Paris, a magnificent party is being thrown. The host goes to a group of new arrivals: The marquis of Orbigny, holding Flora’s arm and the baron Douphol with his obvious and useless attempts to catch Violeta’s attention. Suddenly two gentlemen appear: Gaston, a young noble who introduces his friend Alfredo Germont. Gaston informs Violeta that Alfredo did not let a day go by without asking about her health, during her long disease from which she has just recovered. Violeta stands up to propose a toast, but when the baron refuses to make it, the proposition falls on the novice Alfredo, who, in the middle of the waltz rhythm, pays homage to hospitability, feminine beauty and above all to love. Violeta lets her emotions show and the young man insinuates his feelings to her. Violeta promises to see him again the next day. The party ended and the new day was coming, Violeta, Alone, tries to stop the thoughts in her head: something new has invaded her and fills her with fear, she wants to run away and hide in the delirium of the existence that has brought her to that moment, in the turbulence of the senseless "enjoyment of life". Violeta’s country house, not far away from Paris. The two lovers escape from the pressure of life in society and move to the country house, outside of Paris. Alfredo meets Annina, the faithful housemaid of Violeta who has just returned from a trip. She admits to have gone to Paris by order of her mistress to change some of her valuable possessions for money. Alfredo, who up until then has lived happy and carefree, decides to go back to Paris straight away to collect the money that Violeta needs by any means. Then Alfredo’s father arrives at the country house. He asks Violeta to distance herself from his son, because his daughter will not be able to get engaged with a man from a decent family as she is about to do, if Alfredo insists in living with a courtesan. Even though Violeta cannot imagine living without Alfredo, she accepts to sacrifice herself and writes two letters: one to the baron Douphol surrendering to his unwavering requirements and another one to Alfredo in which she tells him of her desire to go back to her previous life. Alfredo comes back and shattered by the news and finding the invitation from Flora to the dance that will take place that night at her house, decides to attend an leaves in search of his loved one. A group of man and women in disguise is talking about the separation of Alfredo and Violeta. Alfredo arrives and sitting down at one of the tables plays madly, winning with an amazing persistence. When Violeta arrives, arm in arm with her new lover, the baron Douphol, Alfredo makes an allusion about his strange luck saying that it is fitting, since there is a lot of gold needed to be able to buy the favors of a lost woman. The young woman suffers his offense in silence. Later on Alfredo ends up throwing to her face a bag full of coins and challenges the baron on a duel. Alfredo’s father arrives searching for his son and when he discovers the scandal, he harshly reprimands Alfredo for his inexcusable behavior, telling him that Violeta did not deserve such treatment since she had sacrificed herself by following his demands and only for his happiness. When Alfredo finds out the abnegation of his loved one, he shamefully hides on his father’s loving arms. Violeta is lying down since the terrible disease in her chest keeps her bedridden already for a few days. The doctor comes in, helps her stand up, walks her to a divan and tells Annina in confidence that her mistress only has a few hours left to live. A letter to mister Germont informs Violeta that his son came out unharmed from the duel with baron Douphol and that he will go visit her to implore her forgiveness. Alfredo finally arrives and throws himself passionately into her arms. The tender talk they maintain, with the added excessive emotions, only rushes the unavoidable end for Violeta. In a violent coughing fit she sweetly expires in the arms of the only man that she ever really loved. Alfredo spills bitter tears of pain, while the doctor and Annina muster a prayer for the soul of the unhappy sinner who, while greatly sinned, also greatly loved.